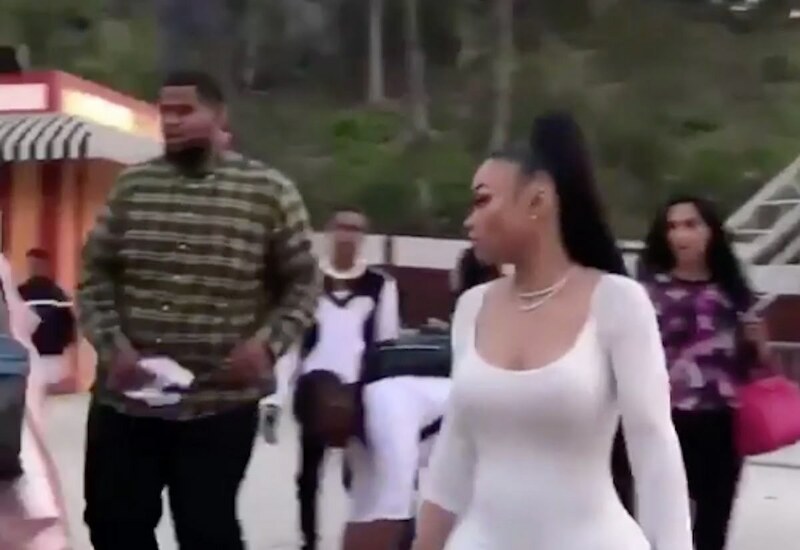 Blac Chyna was involved in a massive brawl at Six Flags on Sunday and it was all caught on camera. It’s still not clear who Blac Chyna was fighting with, but several bystanders uploaded videos of the fight on social media. A few hours prior, the Instagram model was snapping photos and videos from her trip to Six Flags with her boyfriend YBN Almighty Jay. In one clip, you can see her trying to use a mini push car belonging to her son to hit someone, but security held her back. In another clip, you can see two different females getting into a fist fight while Blac Chyna is being held back by a possible member of her entourage. YBN Almighty Jay was in one of the videos trying to calm her down. Some folks on social media are saying he was involved in the brawl. Others are saying that Blac Chyna snapped when someone said something to her about her much younger boyfriend. The pole stripper has so little class yet so much fatass that it is spills out of her misshapen mouth.